Choosing a medium is a quintessential decision when making art. But it is the artist's process that leads to engagement with the medium in ways that activate the viewer's experience. My work shifts between mediums driven by necessity, intuition and discovery to form a varying range of creative results. Necessity dictates my medium in that I shift between the natural world, the digital realm and my skills as an artist to create graphics and images. The process is revealing. Each iteration faces the same set of questions...What am I seeing? What is most interesting? What is this piece about? With each iteration, the work reveals itself more. For example, I did not consider using the art for Raven & Seven as a possible graphic until the final few iterations. 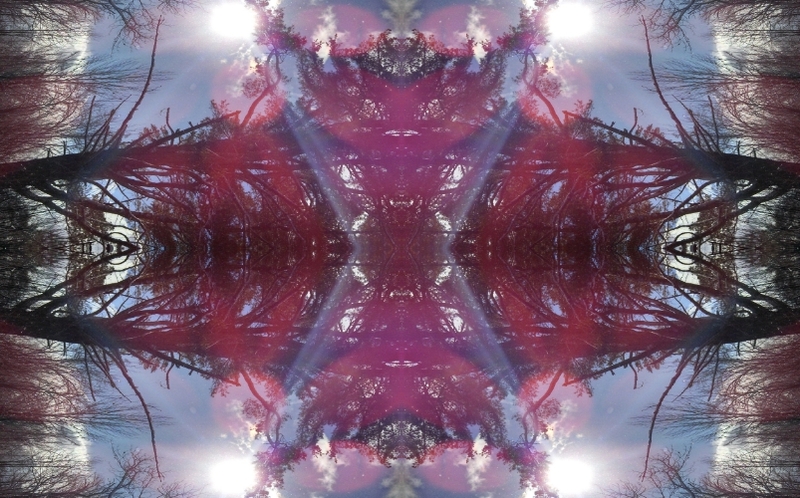 It started as a photo of the sky through the trees on a beautiful winter's day. January 2014 photo of the sun from my driveway, through the pines. This was the perfect winter day. It had just snowed and the sun was shining. I dressed accordingly and headed down my driveway to meet a friend who wanted to take a look at my '88 Toyota SR5. I am not sure why as it wasn't for sale, but I was thankful to be driven from the warmth of the fire to experience this glorious day. I took dozens of photos. The wind would blow a bit and snow would fall from the trees. I was trying to capture the sun shining through the trees and flying snow. I did not capture it in this photo but had success in another. When I sat down to experiment with creating patterns from the landscape (this photo was taken early in my current endeavors), I chose this photo for its colors and for the flare. The flare caused a distinct line that would reference a diamond or X shape. I cropped the part of the photo that I found most interesting. As I mentioned in earlier posts, my process for attaining this motif is to open the image in Photoshop and then reflect it upon itself to create line continuity and distinct shapes. I then remove parts of the mirrored image and work in collage so that my focus is shifting. This allows me to see different details. Parts of the combined images catch my attention and pull me in to work more closely with them. In order to make simpler patterns, I work by extracting the colors and shapes and manipulating them. This part of the process is still exploratory. The collage above is the result of studies in color and line. This image is what I extracted from the mirrored collage. The subtle lines in the center of the image fascinated me. I printed the piece on paper and set out to follow the lines in a unintentional manner. Below is what I derived. If the shape is rotated 90 degrees to the right, a distinct bird-like image becomes apparent. I didn't see this until I had put the drawing down and stepped away from it. I thought it was interesting and set it aside for a number of months. Recently, when I began work on the logo for Raven and Seven, I returned to this piece to see if it would fit into this construct. I scanned the page, pulled the black lines, and cleaned them up. I then ran the scanned and cleaned drawing through Illustrator to adjust some of the lines. In the end, I inverted the drawing and placed it with the lettering for the company. This process of creation and discovery is what drives my work. It is exciting to find abstract complexities in natural forms...I like to think this process somehow reveals a bit of the spirit present in our natural world. To view the final product check out our Raven & Seven shop page.